Okay lovely brides, I have heard you. If I am not blogging you think I am not working (totally untrue), you like to see what my brides have done in the same space you are going to celebrate at (you will see some, but not all, sometimes too many options is not good for you), and you like to see/know what I have been up to. So, based on that I am going to post a bunch of blogs on the popular venues, unusual venues and anything else that I think you may find of interest from the year 2011, and for 2012 my promise to you and myself is anytime I think you will like what we have just helped to create or info to help you along your path, I will be posting as the year goes along. So to start things off, as I have these photos (thanks to Happy Photos/Santa Ana)…. I got a call early in the year from a bride who had been referred by a past bride (love those, and now I have a bridesmaid from this wedding who has booked me for her wedding at the Biltmore in LA in 2012, yay) and needed my help. She was getting married in a church but really needed someone at her reception location to ensure all was well with setup, vendors, and give her peace of mind. I was thrilled as her location was the Segerstrom Center for the Arts in Costa Mesa. 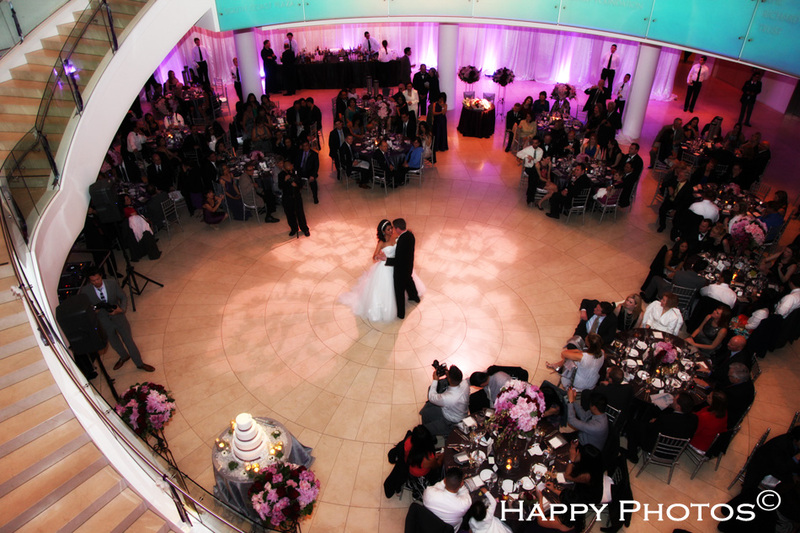 I had been to an event when the center opened and thought it was fabulous and never really thought of it as a wedding event location. Well, you will see by the pictures below it makes for great pics. I had the pleasure of working with Patina Catering group (who I have worked with at other locations and of course like the restaurants around the OC), and her cake was by a chef who had competed on one of the cake shows on tv, so a lot of elements involved that made it nice and fun. Thanks Donald and Annika, it was a beautiful celebration and what lovely family and friends you have.